Contact Daniel Wolf at danielhwolf at gmail dot com, or write him at 1219 23rd Street, San Diego, California, 92102, USA. To phone or instant-message him use his Skype identifier, TerraSegura, or phone (1)(619)546-0748. 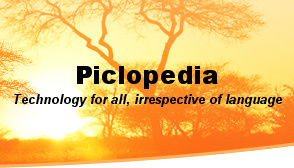 To learn more about Piclopedia and/or to contact other team members, please visit the teambuilding website at www.piclopedia.ning.com.